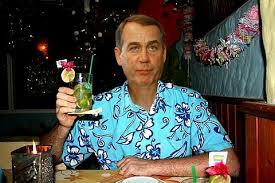 John Boehner is happy where he is, thank you very much. The Republican Speaker of the House told Jay Leno on “The Tonight Show” Thursday that his personal habits would prevent him from embarking on a White House run. As for President Obama, despite several bouts of legislative brinksmanship, Boehner insisted that there is no ill will.